Rustic Canyon had been enjoying great burger reviews for some time, and Monday night was burger night. Fat Bruce Lee and I decided to sample the burger to see if it lived up to the hype. It did not. We found parking on the street, but a valet service was also available, since parking in Santa Monica was generally problematic. We spoke with the manager to determine what sort of beef was in the burgers. We asked if it was Chuck or something more premium. He assured us that the beef was Clod rather than Chuck. Clod is another word for Chuck, so we were about to sample some 18 buck, wet-aged Chuck from Niman Ranch. This was sort of like the staff at Comme Ça telling us that the beef was "Single Cut Shoulder Steak." That also meant Chuck. The most telling line from the Wikipedia entry on Beef Clod was this one: "It is often served in institutional cafeterias due to its low price and the fact that it is easily mass cooked in dishes such as soups, lasagna, and gruel." If "institutional" and "gruel" did not win you over, then this is probably not the burger for you. Don't get me wrong...fresh and properly prepared Niman Ranch Chuck was glorious in the hands of Super Duper in San Francisco. We ordered our meals, and about 15 minutes later the cheeseburgers arrived. The burger served plain. Note the heavily toasted top bun. 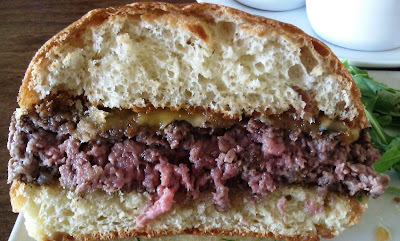 The Beef: The Clod/Chuck led with a powerful and delicious beef note. It was very rich in collagen, and when that melted, it created a wallop of beef flavor. That initial flavor was followed up with nothing. There was no blood, no mineral, and only the faintest hint of aging. That is the common issue with using Chuck and only Chuck--there is no depth of flavor, and this was certainly the case with this burger. The beef was also obnoxiously oily--it probably had a fat content in the 25% range. It was also juicy, but the greasiness far outweighed the juiciness. The beef was loosely packed and created a very tender bite. It was very easy to set this oily burger aside after only eating half. The problem with LA restaurants serving pre-ground, Niman Ranch Chuck has been that most of the flavor was lost along the way. Niman Ranch is a long drive from Los Angeles, and the beef has consistently suffered in quality. The Seasoning: The interior of the 8 ounce, ground Chuck patties was not seasoned, so the interior was relatively bland. The exterior was perfectly salted, and this complemented the beefy flavor of the burger. The Sear: There was decent, broiled sear where they had melted the cheese, but the bottom of the patty was only lightly browned, and it had no crispness or hearty texture to it. The Preparation: Rustic Canyon sourced their Niman Ranch Beef Chuck from Premier Meats, and Premier Meats also ground the beef to something between Medium and Fine. 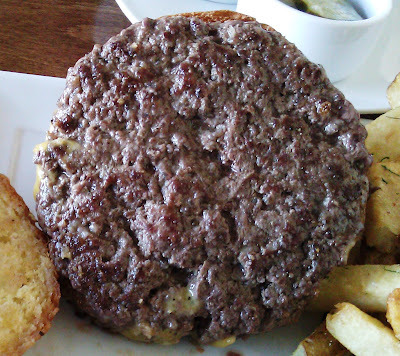 The beef was gently formed into big, loose patties. The patties were griddled on a flat-top. Unfortunately, the burgers were cooked on the cool part of the flat-top so that the buns were better browned than the beef. Previously, the burgers were seared in cast iron skillets and finished under a broiler--time change. The burgers showed up somewhere between Med-Rare and Medium, which was fine for Chuck/Clod. The Cheese: This was a sharp, salty Tillamook Cheddar. The Cheddar added some much needed bite to the otherwise one-note dish. The Bun: The bun was a sweet, crumbly, and slightly dry brioche from a local deli. In the past this had been a Rockenwagner bun--times change. The dryness of the brioche played to the advantage of the dish, because it served to soak up the oil that was dripping from the burger patty. The sweetness played well against the salty seasoning. The top bun was HEAVILY toasted to a very satisfying crunch. That crunch partially filled in the void left by the unseared burger patty. The Fries: These were thick, hand-cut, peel-on fries, which had been browned in canola oil. They had not been crisped, though. A rice bran oil would have done the trick for these thick, earthy fries. The fries were properly seasoned with granulated salt. The Toppings: The onion fondue, which I ordered on the side, was simply not a fondue. It was a pale onion compote, which tasted strongly (cloyingly) of honey. This was an odd choice for a burger topping as Fat Bruce Lee learned the hard way as he was scraping off the "fondue" after a single bite of his cheeseburger. It was a proper compote, and it was suitable as a desert. The remoulade was a nicely tarted up tartar sauce, and it was good with the fries. The arugula--this was downright delicious. It had a nutty character that brought to mind the Allegria Salad at Allegria in Malibu--back when it was still there. I miss their Gorgonzola Cream Gnocchi. The Value: It was 18 buck Chuck from a farm many, many hours away. The value was weak considering that there were burgers all over Los Angeles, which were made with premium beef cuts at half the price. I would not return to Rustic Canyon for a burger. It was over-priced considering the quality of the ingredients and the average preparation skills that went into it. The burger was quite good, but it was certainly not excellent. Burger Review : The burger at Rustic Canyon was better than average in terms of flavor but for a much higher than average cost. This burger was priced well above its value. They charged tourist trap prices to locals. It was also as oily as I imagine Mike Sorrentino's hair to be on an average Saturday night. Like Comme Ça, it seemed that Rustic Canyon was coasting on its reputation, because the quality was simply not there. Rating...3 Bites ... The poor value of this generally tasty but poorly seared burger dragged it down a full point. "The problem with LA restaurants serving pre-ground, Niman Ranch Chuck has been that most of the flavor was lost along the way. 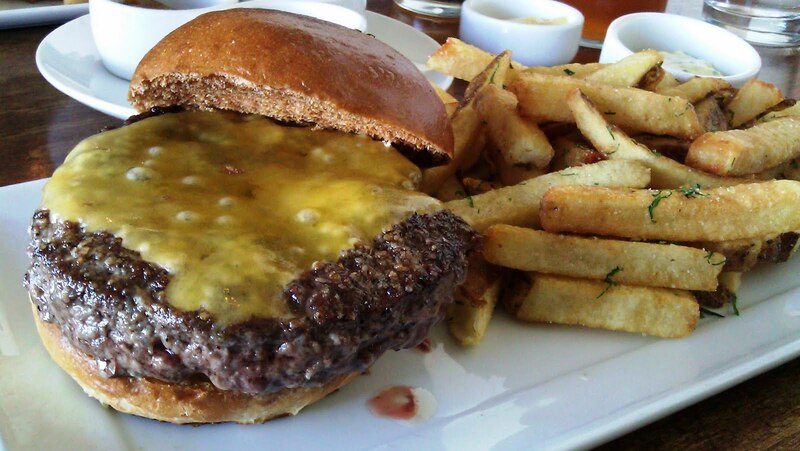 Niman Ranch is a long drive from Los Angeles, and the beef has consistently suffered in quality."